Over the last few years I’ve had the chance to sample dry aged beef at some excellent steak houses. Dry aging is done to beef only: primal cuts are kept for several weeks so they lose moisture and natural enzymes beak down muscle fibre, creating a strong beef flavour and a tender texture. This was the common practice for millenia until vacuum sealing arrived and primal cuts were vacuum packed and wet aged, meaning no moisture loss. From a retail standpoint dry aging takes shelf space, time, and results in a loss of weight that hits the pocket-book. Wet aging provided no loss of weight with a great loss in flavour but economics ruled out and hardly any of us know what dry aged beef tastes like. Now everyone wants to coat their steak in a rub or sauce to give it some flavour. It hit me when we were at a high end steak house in Washington D.C. several years ago. I had ordered a bone in ribeye and was chewing away when I realized the meat in my mouth had no taste or flavour whatsoever. From that point on I only go to a steak house if they dry age their beef: call ahead and confirm this is their practice. With a professional temperature controlled meat locker beef is aged two to eight weeks. The taste I can only describe as “beefy”: it has to be experienced. Since high end steak houses usually mean high end prices I wanted to do something at home to replicate the process. It turns out to be fairly easy to do basic dry curing at home. Start with a primal cut such as the whole striploin; I get mine at Costco since their prices are fairly reasonable and it’s Canadian AAA beef. I take it out of the vacuum packaging, give it a rinse and wrap it on a clean cotton towel then slide it into the middle back of my refrigerator since the temperature seems the steadiest there. I replace the cotton towel every day and keep the beef about a week: this results in a ten percent volume loss. 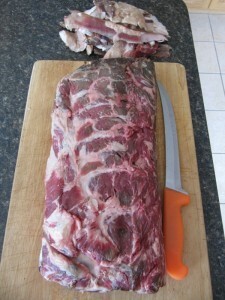 The piece pictured above was 6.1 Kg before aging and 5.5 Kg after. During the aging process the outer layer of the beef dries out and needs to be trimmed when you’re done: that pile at the top of the picture is my trim pile, another 0.6 Kg loss. What did I get for my 20% volume loss? After slicing steaks and grilling them my wife immediately noted the rich beef flavour; I found it really added. I only add salt and pepper before grilling and no sauce when serving: the steak should stand on its own. These dry aged steaks did that and more. Well worth the effort. I should mention that the cotton towels will smell horribly if not washed immediately; I give them a quick soak in cold water to remove the blood and smell.